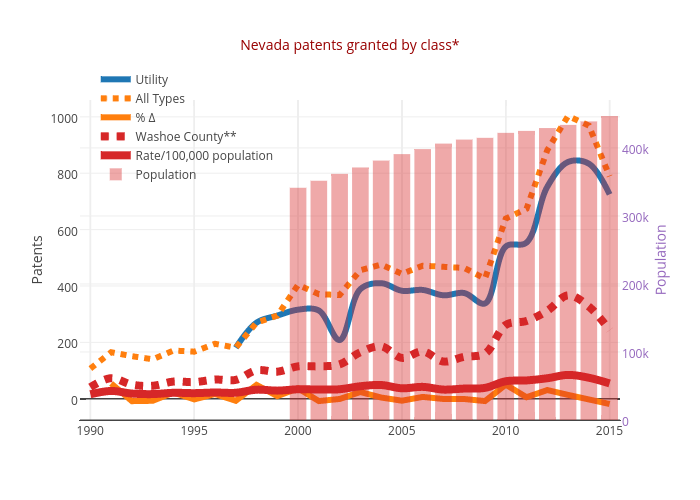 Truckeemeadowstomorrow's interactive graph and data of "Nevada patents granted by class*" is a scatter chart, showing Utility, All Types, % Δ, Washoe County**, Rate/100,000 population, Population; with Patents in the y-axis. The x-axis shows values from 1989.5 to 2015.5. The y-axis shows values from -75.35555555555555 to 1059.7555555555555.